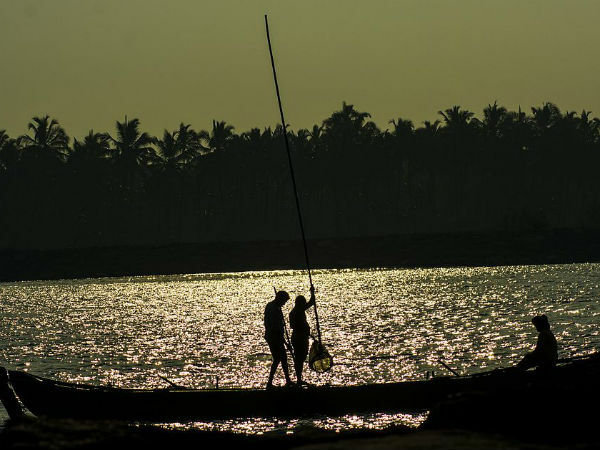 Settled on the beautiful shore of the Arabian Sea in the Kasargod district of Kerala, Kanhangad is an amazing destination that can make for an idyllic weekend stoppage. It is located at a distance of about 80 km from Mangalore and has a history dating back to the Sangam Period when the region was under the control of the Mushika kingdom. Therefore, it is home to several ancient sites and age-old monuments. However, it is generally popular for its highly revered temples and lush green surroundings. On account of the presence of every type of attraction, ranging from natural sites to historical wonders, it should be visited by every traveller and tourist. Moreover, you will able to explore things comfortably in an uncrowded and unpolluted environment. Following is the list of the major places one must visit while in Kanhangad. Read on to learn in detail about them. If you are in dire need of peace and composure, then you must not miss visiting Anandashram while in Kanhangad. Founded in the year 1931 by Swami Ramdas and Mother Krishnabai, this beautiful ashram is a perfect place for meditation and introspection. It also has a huge library where you can learn a lot about spirituality and how to make our lives blissful. Anandashram is one place that will certainly soothe your nerves and calm your mind, body and soul. You can also visit the samadhi temples of the founders here. So, if you are looking for a place in Kanhangad that harbours ataraxy, then Anandashram is an amazing choice for you. How about taking a stroll on the shore of the Arabian Sea and enjoy its rejuvenating atmosphere? If yes, then add Kanhangad to your travel planner. Located at a distance of about 4 km from the centre of the town, this beautiful beach is known for its uncrowded and unpolluted environment. Therefore, it attracts several offbeat travellers from all over the state. There are several other beaches in the close proximity of Kanhangad Beach that can add to your wonderful experience. The list includes Balla Beach, Pallikare Beach and Bekal Beach. If you are a beach lover, then believe us, Kanhangad is a piece of heaven for you. If you are looking forward to enjoying history and nature simultaneously, then there cannot be a better place than Bekal Fort in and around Kanhangad. It is located at a distance of about 12 km from the centre of Kanhangad and is the largest fort in the state covering an area of about 40 acres. As per records, it is said to have been established during the mid 17th century by Shivappa Nayaka, a ruler of the Keladi Nayaka kingdom. As the fort is located at Bekal Beach, it attracts thousands of tourists every year. Over a period of time, it has become a popular weekend escape for locals. Located at a distance of about 6 km from Kanhangad Beach, Madiyan Kulom Temple is an ancient site of religious importance and is dedicated to Goddess Bhadrakali. However, you can also find images of several other deities including Bhagavathi and Bhairavan. The temple is mostly visited by local devotees. However, as it is said to have been established several centuries ago, it also remains a weekend destination for numerous history lovers. If you are looking for a place to enjoy divinity, serenity and history, then head towards this age-old marvel. The major festivals celebrated here include Kali Puja, Diwali and Navratri. Hosdurg Fort is another fort that can take you back in time and teach you a lot about the history of Kerala. It is one of the few forts in the state that were built during the reign of the Keladi Nayaka dynasty. Even though the fort is in ruins today, it attracts hundreds of history lovers every year. With caves and strong bastions still in existence, Hosdurg Fort stands beautifully narrating age-old legends of its survival and existence. You can also visit the nearby ancient temple, Poonakavanam Karpooreswara Temple, that was also built by the Keladi Nayakas.